As widely expected, the central bank left its cash rate unchanged at 4.25 per cent, a result tipped by all 19 economists in a Bloomberg survey. 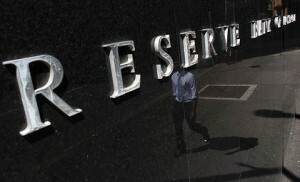 Expectations that the RBA would soon add to the back-to-back monthly rate cuts at the end of 2011 have largely dissipated after the central bank surprised pundits and markets alike at last month’s rates meeting by declaring that its monetary policy was ‘‘appropriate’’ for now. The attention of many borrowers will now switch to this Friday when the ANZ bank will make again announce its interest rates independently of the RBA. Last month, the ANZ defied politicians and the public alike by opting to lift its variable mortgage lending rate by 6 basis points, or 0.06 percentage points, citing higher funding costs that it had to recoup. The move was quickly followed by most rivals, with 42 lenders raising their variable lending rates by an average of 10 basis points, according to data from rate tracking agency Canstar. The strength of the Australian economy will be revealed tomorrow with the release of the national accounts for the December quarter. Figures out this week indicate that growth may come in a bit higher than had been expected as rising exports and increased government spending stoke demand. Still, many companies outside the mining sector have complained of weak demand and rising competition from abroad because of the strong dollar. Westpac added to a long list of firms announcing job cuts, revealing today the loss of another 126 positions. The RBA, though, has in recent weeks taken a more upbeat assessment of the prospects for the US economy and views a collapse of the euro zone economies as less likely. However, cheer about a reviving global economy is muted somewhat by indications that the economy of China – Australia’s largest export market – will expand by a sub-8 per cent rate in 2012. There may be some further interest rate relief ahead. Prior to today’s RBA decision, financial markets were betting that the central bank will cut its cash rate by 25 basis points to 4 per cent by June. Previous PostHome Staging Advice – Room by RoomNext PostSOLD in 48 hours!